If you have a second home or move around to different places in the area, it might be a good idea to just use one permanent mail address. One of the advantages of this is that you can be notified if there is anything in the box so you do not have to make unnecessary trips to retrieve your mail. For small business owners or SOHOs (small office, home office) your home address can remain private. This is especially beneficial to those businesses that mainly operate out of their home and prefer not to advertise their home address. Someone will always be there to receive mail or packages even if you’re not. No more mail and packages piling up at your home. 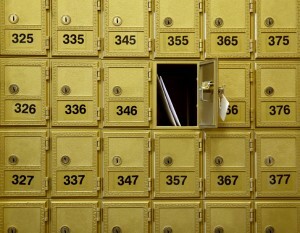 A private PO Box can receive items from any shipping service including UPS and FedEx. Instead of an impersonal PO Box, which can decrease the credibility of a home business, the street address you use increases the credibility of a home business. Ask your local Postal Connection Store if they offer a digital mailbox service. This is a protected inbox where you can receive business mail via the internet in one-spam free location.